The Clover Flower Garland Pendant is made from sterling silver sheet metal which has been pierced by hand then folded to create a flower garland. The Clover Flower Garland Pendant is made from sterling silver which has been oxidiesd. 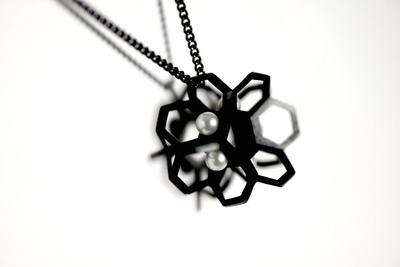 Freshwater pearls have been added to create contrast in the piece. This item will be handmade to order and dispatched within 12 working days.